The drafting and welding students have been hard at work since January on their hog pen project. Pictured is a welding student working on portion of a hog pen. The MCCC students have been so passionate about this project, some volunteered their free time to work during their spring break. The prototype of the new hog pens. Drafting students working together on the design of the hog pens. A welding student working on a portion of a hog pen. 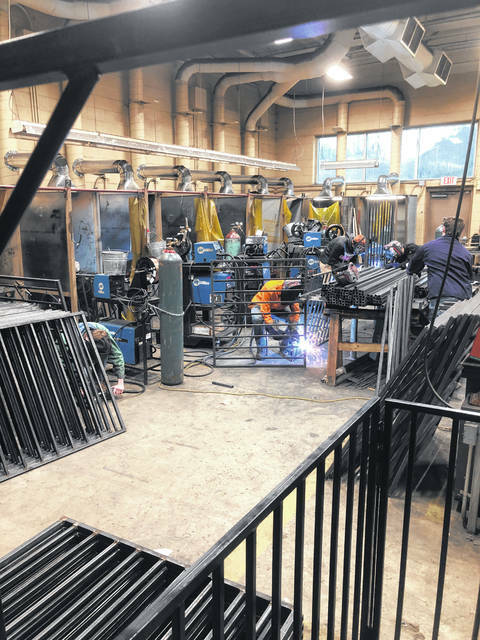 POINT PLEASANT — The drafting and welding students at the Mason County Career Center (MCCC) have been hard at work on a project not only for credit in their classes, but to also help their community. Stephen Littlepage, Robert and Louise Claflin Foundation president, shared Mason County Fair Board Member Curtis McConihay recently applied for a grant through the Claflin Foundation in order to re-do the hog pens at the Mason County Fairgrounds. 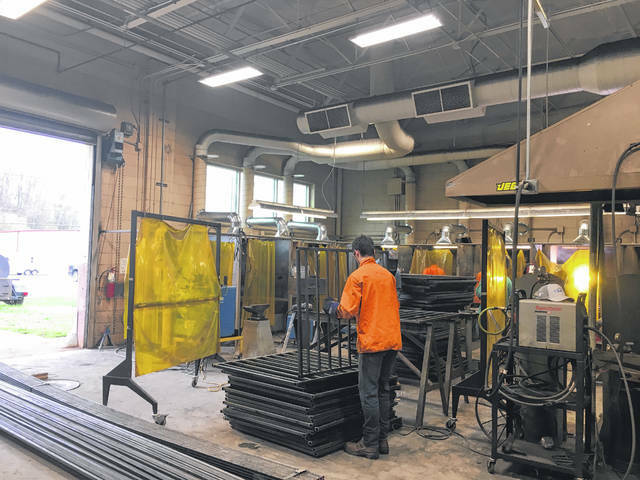 Through the acceptance of the grant, the Mason County Fair Board members, the board members of the Claflin Foundation, and the Mason County Career Center welding and drafting students and staff are collaborating on the project. Littlepage explained there are five different sets of hog pens to be worked on and the first two sets need to be completely replaced as they are in the worst condition. 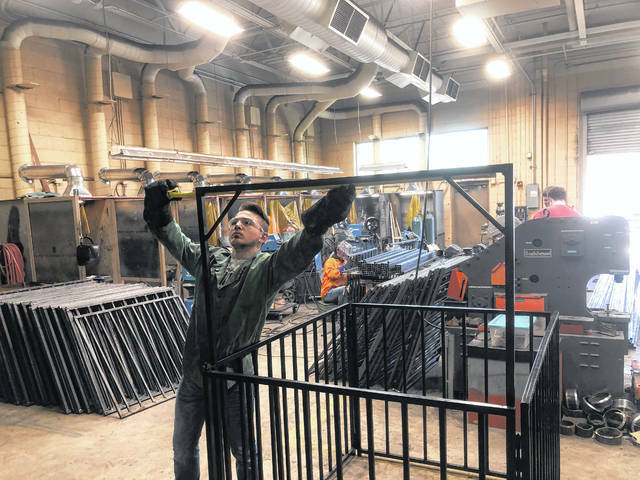 For this year’s fair, the drafting and welding students will be working on the first two set of hog pens which will be 56 new hog pens. McConihay commented this was the second year he had applied for this grant. The first year, the project cost was going to be around $42,000 for a “store bought” price of hog pens, but this year because of the collaboration with the students and staff at MCCC, the entire project will only be around $30,000. The initial cost of the first two sets of hog pens is approximately $13,000. 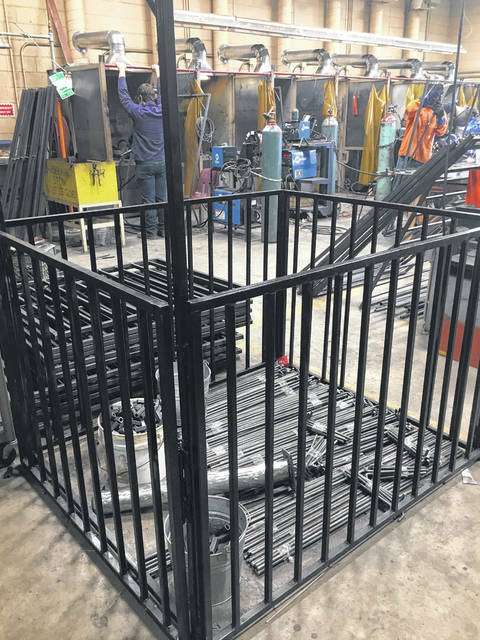 Brent Hereford, MCCC Welding Technology instructor, shared his students are in the assembly process of the hog pen project right now which has been going on for the past three weeks. Towards the end of May, the installation process of the hog pen project will begin after the hog pens are power coded. 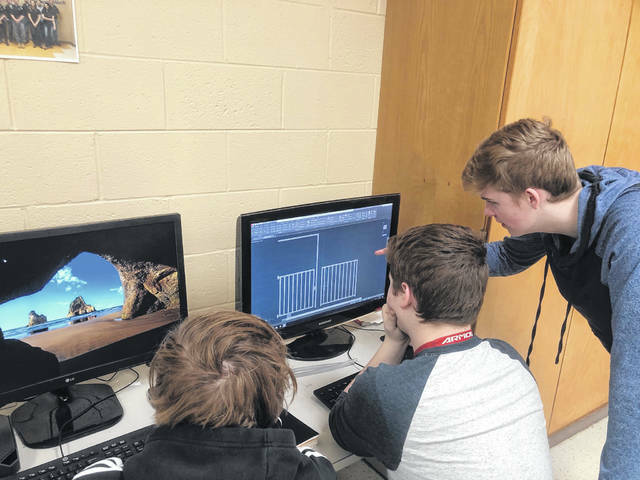 As with the other classes at MCCC with the classroom environments being styled as a simulated work place, Hereford commented his students have been working on this project as if it was their daily job. Some of the students have shown so much passion with their work they volunteered to work on the hog pen project over their spring break. Stephen Richardson, MCCC Drafting instructor, explained his drafting students collaborate on several projects with the welding students as well as other classes at MCCC. For the hog pen project, the drafting students did the design work and then the welding students took that design to the fabrication. During the designing process there were approximately three to four re-designs that had to be done until the perfect prototype was created. The collaboration of this project began in January.